BERLIN (Reuters) - German Chancellor Angela Merkel pledged on Tuesday a new development fund to tackle unemployment in Africa, a problem spurring the mass migration that has shaped her long premiership as it nears its end. She needs the Compact with Africa summit to show that progress has been made in addressing the aftermath of one of the defining moments of her 13 years in power: her 2015 decision to open Germany's doors to more than a million asylum seekers. The Berlin summit, attended by 12 presidents and prime ministers including Egypt's Abdel Fattah al-Sisi, South Africa's Cyril Ramaphosa, Ethiopia's Abiy Ahmed and Rwanda's Paul Kagame, is designed to showcase the continent as a stable destination for German investment. The aim is to create good jobs for Africans, easing the poverty which, along with political instability and violence, has encouraged large numbers to head for Europe. But with Africa's population growing at almost three percent a year, the task is enormous. "We Europeans have a great interest in African states having a bright economic outlook," Merkel said in her opening speech, announcing the fund to help small and medium-sized enterprises from both Europe and Africa to invest on the continent. The 119,000 Africans who arrived in Europe in 2018, according to the International Organisation for Migration, are the tip of the iceberg. International Labour Organisation figures show that 16 million migrants were on the move within Africa in 2014. Berlin hopes Germany's manufacturing-based economy, which drove Eastern Europe's rapid economic growth after the 1989 collapse of Communism, could turn things round. Merkel has said she will remain chancellor but that her current, fourth term up to 2021 will be her last. 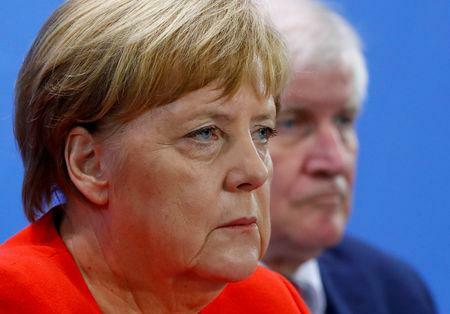 A whopping 71 percent of Germans welcomed Merkel's decision, a poll released Tuesday by broadcasters RTL and n-tv showed. This would be part of a "Marshall Plan for Africa" - named after the U.S.-funded plan that helped to rebuild European states including Germany after World War Two - that she sees as central to her legacy. Merkel presented her decision to open Germany's borders in 2015 as an unavoidable necessity driven by the vast scale of the human tide, that year mostly fleeing the civil war in Syria. The crisis has upturned European politics, bringing the far right to power in Italy and Austria, and in Germany revitalising the Alternative for Germany (AfD) party, whose demand that the country shut its borders to migrants helped to fuel its surge into parliament in last year's election. A successful outcome to the summit may help to strengthen Merkel's case for remaining chancellor even after stepping down from the party leadership, and could quieten her coalition partners in Bavaria's conservative CSU and the Social Democrats (SPD).